Singhal Jewels has developed advanced precision technology that does away with the limitations and flaws of the traditional casting process. Starting with a clean block of precious metal and using precision tools, the craftsman give immaculate shape to his imagination without any limitations. No surface imperfections, no using additional metal and no compromise with the aesthetic appeal. Call it the renaissance of fine jewellery creation. 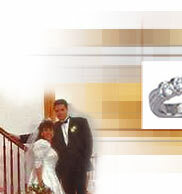 Our bands, gold or platinum are crafted in fine non-porous metal that give them superior strength and longer life, much like the sentiments they celebrate. The inner surface of the bands are also smoothened to give you comfort fit. 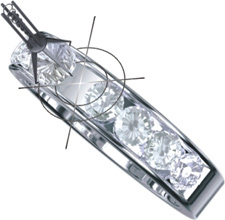 Diamonds are evaluated on their four Cs: Carat, Colour, Clarity and Cut. Each diamond used at Singhal Jewels is perfectly cut to explode with unrivalled fire and brilliance. For centuries, diamonds have been set by hand and this results in imperfections and inconsistencies. 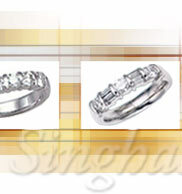 At Singhal Jewels, the diamonds are machine-set for high precision and long life. We use the minimum metal coverage (MMC) technology and only the least amount of metal that is necessary to hold the diamond properly, is used. Thus each diamond of your band is exposed to its full glory to look like a string of diamonds. To ensure that diamonds show their best brilliance, we mirror-polish the metal before the diamond setting. 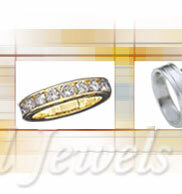 Singhal Jewels brings to your finger a new era in jewellery craftsmanship. 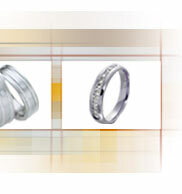 Choose from a wide range of beautiful bands in gold and platinum. With Singhal Jewels, you may even choose the diamonds and precious stones, and get customized jewellery made to suit you taste, budget and occasion.